This quiche is so easy it seems like you're doing something wrong as you make it. 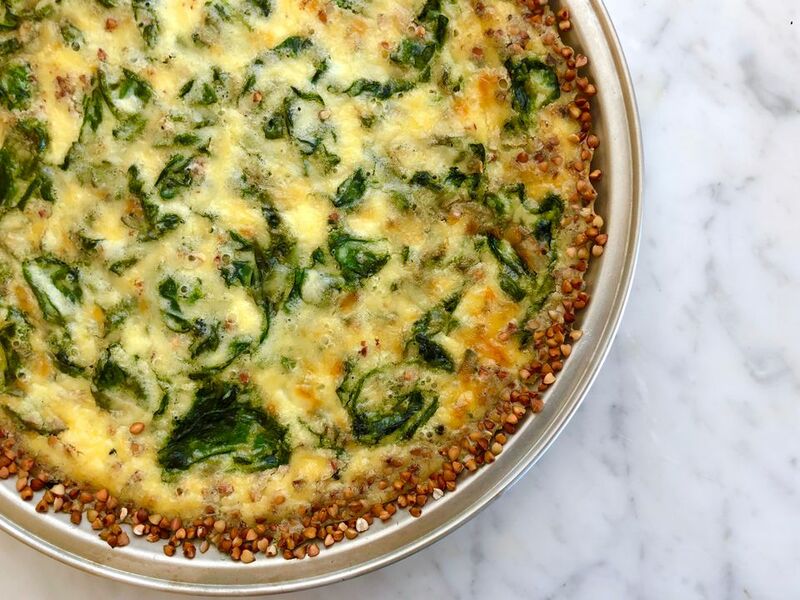 That's because the crust makes itself—the egg mixture softens the toasted buckwheat groats as the whole thing bakes and they turn into a beyond-easy, gluten-free, delicious crust. The trickiest thing is finding the buckwheat groats in the first place. Look for them in health food stores, specialty grocers, and co-ops with large bulk foods sections. The effort to find them is worth it because you use them to line the pie pan and that's the crust. No joke. Serve this quiche as part of a casual brunch with fruit salad and perhaps some bacon or sausage alongside. Or, opt for a light and simple dinner—all you need is a green salad for a complete meal. Use 1 tablespoon of the butter to coat the inside of a 9-inch pie pan generously. This layer of butter is what the buckwheat will stick to, so seriously, be generous and thorough. Put the buckwheat in the buttered pan. Shake and tilt the pan so the buckwheat groats cover the bottom and sides of the pan in an even layer. Use your hands to fill in any open spaces, if needed. Set the buckwheat-coated pan aside. Trim, peel, and mince the shallots. Heat a large frying pan over medium-high heat. Add the remaining tablespoon of butter. Once the butter is melted, add the shallots. Cook, stirring frequently, until the shallots are softened about 3 minutes. Add the spinach. Cook, stirring frequently, until the spinach leaves are wilted, release their liquid, and that liquid has evaporated, about 5 minutes. Set aside to let cool slightly. Crack the eggs into a medium bowl. Whisk the eggs until they're well blended, with no bits of yolk or strings of white. Add the milk, cream, and salt. Whisk to combine. Sprinkle about half the cheese on the bottom of the buckwheat-coated pan. Add the spinach on top of the cheese. Gently pour in the egg mixture. Sprinkle with the remaining cheese. Bake until the egg mixture is puffed and set, about 40 minutes. Let cool at least 10 minutes to set before slicing. Serve warm or at room temperature. *If you can't find toasted buckwheat groats, simply toast raw ones in a large frying pan over medium heat, stirring and tossing frequently as they turn from slightly greenish to a toasty brown. Use any kind of cheese you like! Cheddar, parmesan, goat cheese, fontina, gouda—they're all good choices. Crumbled feta is particularly tasty here! That said, if you'd like, feel free to omit the cheese—the quiche is still delicious! Add 2 to 4 tablespoons minced fresh herbs such as chervil, dill, or parsley to the egg mixture. Use a different vegetable. A similar amount of cooked asparagus, peas, fava beans, or zucchini are all good options. Add 1/4 to 1/2 cup crumbled cooked bacon for a meaty version. Sprinkle in 2 finely chopped green onions along with the spinach.